Welcome Pubs - the National Guide to your Local Pub. We aim to be the most comprehensive online resource possible for pubs in the UK. The entries are submitted and updated by the pubs themselves meaning that the information here is always up to date, right up to what the Guest Ale of the week is. Please use the search feature below to find the pub you are after. During idle moments, we have a Fun Page with a growing number of amusements for you, click here. For an A to Z listing of the Pubs in our database, click here. Winters here ! - find a pub with a Fireplace near you. 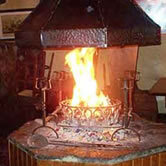 To find a pub near near you with a fire place, just fill in your Town or County and click search. Should you wish to contact us to discuss anything related to this site, please click here for our contact details. Want to reach a massive audience? If so, then sign up today!